One hour S-W of Paris, In the crypt of the cathedral, an 11th or 12th century(?) statue was burnt on an execution pyre during the Revolution in 1793, replaced with another statue in 1857, then replaced again in 1976 with this present, more accurate copy of the one that was burnt in 1793, 80 cm, natural pear wood. 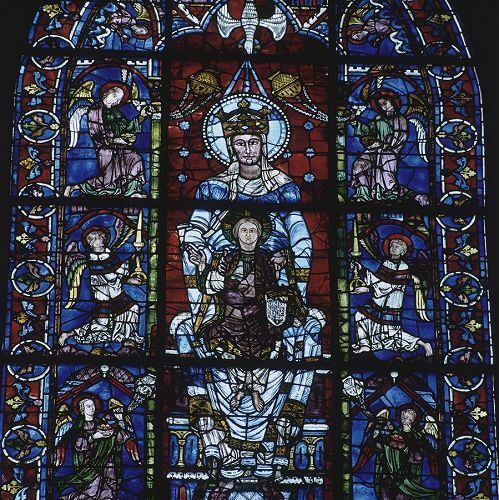 3. in the most famous window of Chartres, Our Lady of the Beautiful Window, crowned and wrapped in her blue mantel as the Queen of Heaven. These words referred to several ancient Christian legends recorded between 1201 and the 1600s. They speak of Pagans in Gaul (modern day France), Rome, and Egypt all worshipping an unknown virgin with a divine child who had been prophesied to them. Only generations later would they find out that the virgin and child that had been foretold them would be Mary and Jesus of Nazareth. The legend concerning Chartres directly speaks highly of the druids of that territory as learned wise men with prophetic vision. In the year 50 B.C., so the story goes, they heard of Isaiah's prophesy of the virgin who would bear a divine child. (Is. 7:14: "Therefore the Lord himself will give you a sign: Behold, the virgin will be with child and bear a son,…") The druids knew by divine inspiration that this would be the one true God who would prove their old gods to be mere idols. Full of joyful expectation, these Celtic priests sent a delegation to Jerusalem to inquire if the miraculously conceived baby had already been born. Meanwhile a prince of Chartres ordered a statue of this unknown virgin and child sculpted. Not knowing their names, he simply referred to the image as 'virgo paritura,' the virgin who will bear a child, and chiseled that title onto the base of the sculpture. For fear of the Pagans, whose religion she would change forever, he honored her in a secret place within the same sacred grotto where "pagan idols" were worshipped. It turned out that his fear was unfounded because soon the whole population had great devotion to the Virgin and lovingly called her the Lady of Chartres. This is a good example of how early Christians found creative ways to christen their ancient goddesses and keep worshipping the feminine face of God. Several elements in this legend are actually true. 1. The most important Druidic sanctuary of Gaul was indeed the grotto in Chartres,(*5) which was later turned into the crypt of the cathedral. Julius Cesar's account "On the War of the Gauls" (De Bello Gallico) mentions that once a year all the druids of Gaul would gather here, in the territory of the Carnuts, the tribe of Chartres, to decide disputes and hold religious celebrations. The emperor does not however mention a 'virgo paritura,' as later Christians liked to believe. 2. As is typical for Druidic goddess sanctuaries, a sacred well was part of the site. (*6) It is still visible today, although it has run dry. In pre-Christian times not just the well but the whole ensemble of caves was called 'holy, strong places' (Saints-Lieux-Forts). When it was Christianized it became the 'well of the holy strong ones' (Puits des Saints-Forts), said to have become miraculous ever since the first martyrs of Chartres were drowned in it. 4. The Celts, Romans, and Egyptians did of course worship mother goddesses, many of which were sometimes referred to as Virgins. They were often depicted enthroned and with a child on their knees, after which the Christians modeled their "seat of wisdom" Madonnas. So there is indeed a striking continuity between the pre-Christian and the Christian expression of the feminine face of God, only that Christians preferred reversing the sequence of cause and effect. Here we see the drawing of a 3rd century statue of a Gallo-Roman goddess found in a funerary pit. Unfortunately the child on her lap was blasted to pieces by the pick axe of the unsuspecting workers. (*8) Still, her resemblance to the Madonnas of Marsat, Saint Gervazy, and Our Lady of the Good Death in Clermont-Ferrand is striking. In Gallo-Roman times, i.e. when Gaul was occupied by the Romans and the two cultures merged, a temple to Persephone, Queen of the Underworld, (also known as Kore) was erected on top of the Druidic grotto. (*9) Persephone was the daughter of Demeter, the Earth-Mother, and Zeus, the Sky-Father. So the Druidic Great Mother and Child became Persephone and Demeter before they once again changed their personas, in order to become Mary and Jesus. The Gallo-Roman Queen of the Underworld became Our Lady Under the Earth. In the upper cathedral, in the left gallery, 1508 A.D. , replacing a 13th century gilt statue, 115 cm not counting the pillar, painted wood. In 1508 this now whitened Black Madonna was commissioned by a canon priest as a wooden copy of a much loved 13th century silver and gold plated Madonna called Notre-Dame la Blanche (Our Lady the White One). Around 1540, she was given to the cathedral. (*10) She holds a pear in her right hand. Conceived from the start to represent other statues, this has been her fate ever since. Some time after Our Lady of the Underworld had been executed and before she revived in her 1857 incarnation, Our Lady of the Pillar filled her older sister’s throne in the crypt. In 1806, she was placed on the pillar in commemoration of the oldest Mary statue in Europe: Our Lady of the Pillar in Zaragoza. Before that, she was simply known as “the Black Virgin”. As so many others, she had turned dark after years of candles burning before her in supplication, but nobody knows at what point exactly she received the title “Black Madonna”. She was strategically placed in the Cathedral. Why? The Cathedral Guide says because the faithful who came to kneel before Our Lady the White One on the main altar were disturbing the canon priests during their services. The people’s adoration had to be moved aside to the gallery where Our Lady of the Pillar now resides. (*11) This is typical for the priests at Chartres: they seem always bothered by popular devotions to Mary and always looking for ways to shove her aside. Let’s take a look at their track record. Our Lady of the Pillar was assigned her place in the cathedral at a time when the Catholic Church was deeply embarrassed and threatened by the Protestant Reformation, which had just begun to sweep across Europe. It responded by “modernizing” itself, but not in the areas where it was really needed. Rather it tried to eradicate things it had long endured for the sake of the faithful: their devotion to miracle working wells, stones, and statues, which had its roots in Pagan spirituality. The Reformation provided the perfect excuse to finally cut those roots. Our Lady from Under the Earth, in her magical cave with powerful earth energies and miraculous waters was a prime example of the kind of “superstitions” from which the Catholic Church sought to free itself. Of course things move slowly in this big old Church. Chartres was like a medieval version of Lourdes. A constant stream of pilgrims came to the well in the crypt for healing. The sick would sleep in the crypt where nuns took care of them. Other pilgrims slept in the upper cathedral. This was not a scene one could end over night. 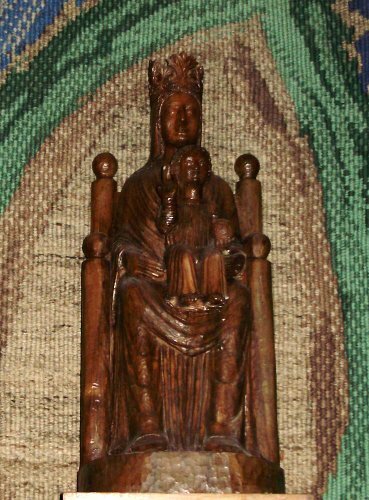 The first move was to provide a less powerful but still acceptable Black Madonna in a less powerful but still acceptable place: Our Lady of the Pillar in her little chapel in the gallery of the upper cathedral. She is one of four original windows of the cathedral (crafted in 1180) that survived the catastrophic fire of 1194 and of this window only the panels depicting the Virgin and Child survived. Her beauty and cobalt blue mantle were talked about all over Europe, wherefore some call her the Blue Virgin.The fire must have paled much of her mantle. (*16) She used to be an object of veneration and was invoked by women before childbirth. *1: Around 800 A.D. this 'sancta camisia' (holy shirt) was sent as a gift from the Empress Irene of Byzantium to Charlemagne. His grandson, Emperor Charles the Bold, gave it to Chartres cathedral in 876. It was believed that Mary wore this garment as she was giving birth to Jesus. Experts have confirmed that the fabric comes from 1st century Palestine or Syria. Two fragments of the original garment, which resembled a sari, survived the Revolution and are kept in the cathedral. *2: E.g. Louis Charpentier, Mysteries of Chartres Cathedral, Avon Books, 1980 and Jacques Huynen, l'Enigme des Vierges Noires, Éditions Jean-Michel Garnier, Chartres: 1994 . *3 Early French Christians called her "Benoiste Dame Souterraine" (Blessed Subterranean Lady). Sophie Cassagnes-Brouquet, Vierges Noires, Éditions du Rouergue, 2000, p. 130. *5: Some scholars disagree, but that seems to be their job. As the Tibetan say: "If scholars don't disagree with each other they aren't scholars. If mystics don't agree with each other they aren't mystics." *6: Other French Black Madonna sites that include sacred wells to this day are Marsat, Vassivière, Orcival, Notre-Dame-de Font Sainte (Our Lady of the Holy Well) in Église-neuve-d'Entraigue, etc. *7: Renée Merlet, the archeologist who in 1900 re-discovered the 'Well of the Strong' in the crypt of Chartres after it had been hidden by the church in an effort of 'modernization' in Revue archéologique 1902 volume, article "La Cathédrale de Chartres et ses Origines: à propos de la découverte du puits des Saints-Forts" pp.232-241. *10: Canon priests were in service at a cathedral and lived together near it. Comissioned by Wastin des Feugerets around 1508, but not given to the cathedral and placed there till 1540 by Pierre Bordeaux. See: French governement sitethat lists important pieces of art with their history. *14: Offered Mon - Sat 11:00 a.m. - 5:15 p.m.
*16: Etienne Houvet, op. cit. p.67 and the French Wikipedia article on this window.